I gripped my sabre, assumed the en-garde position and glared at my victim. Josef Cohen, age 16, was about to be dispatched. I would show him no mercy. 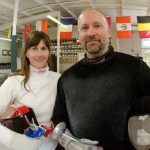 We were facing each other on one of the long dueling strips at the Rhode Island Fencing Academy in East Providence. Around us, dozens of students practiced, but I screened them out. That’s what a great swordsman does — and I’ve been one since reading the Edgar Rice Burroughs “John Carter of Mars” series at age 12 or so. At least in my mind I am. Alex Ripa, 46, owner and lead coach at the Academy, made sure our gear was on right. Both Josef and I had long electric cords plugged into our suits and sabres, so each touch would register on the scoreboard. Ripa asked if we were ready. I smiled through my mask, refusing to be intimidated by one minor factor. Josef Cohen, a student at Barrington High School, is ranked fifth in the nation in his age group in sabre fencing. I had told him to give me his best. I wanted to experience a full-on duel. Nor would I hold back on him. So what if he was just a kid? My plan was to slice him to ribbons, which you’re allowed to do in the sabre category. Or at least “cut”. Coach Ripa told me there are three weapons in fencing. With the first two, epee and foil, you can only “pierce” your opponent with a thrust. But Josef Cohen’s sword of choice is a sabre — where slashing, or cutting as it’s called, is allowed. I planned to do so without pity. Coach Ripa asked if we were set, then gave us the go command. You might think that a fencing school in a small state would have little prominence. But I discovered Rhode Island is one of six fencing “epicenters” in the United States, according to American Fencing Magazine. At a past youth world championship in Belfast, Northern Ireland, there were so many Rhode Island competitors, people were asking Coach Ripa if there’s something special in the water. In fact, it’s largely because of the Fencing Academy. 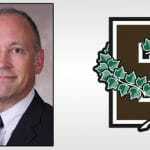 It was founded in 1994 by Ripa, a Portsmouth native who was assistant fencing coach at Harvard and is currently assistant at Brown. A few years ago he and his wife, Jill, also a coach, consolidated the Academy’s Warren and Warwick schools into one big facility in East Providence, not far from Providence Country Day. The Ripas now have 500 students, five full-time coaches and three more who work part-time — that’s a lot for a fencing school. Ripa, 46, comes off as a regular, mild-mannered guy, but chat with him about fencing and he sounds like a sensei. He said the academy’s priority is to teach character and self-control as much as fencing. For example, before a big match, he has his students visualize losing so they can face the worst, realize it’s survivable, and therefore come into the duel with less anxiety — and be good sports if they don’t win. I asked him how he came up with that. He told me that in the book itself, the Samurai visualize being pierced by swords, killed by arrows and trampled by horses, but Ripa has toned that part down a bit. I sat down with him in one of the two gym-sized spaces at the Academy. Three of his top pupils joined us. Aside from Josef Cohen, there was Morgan Partridge, 17, a Providence Country Day student who has ranked number 1 nationally in the girl “cadet” category of 16-and-under. The other was Dominique Tannous, 18, of St. Mary Academy-Bay View. She has dual citizenship in Lebanon and a solid shot at being in the Rio Olympics in 2016. To make it, she has to rank at the top not just in Lebanon but throughout the Asia-Middle-East region. That includes well over a billion people, but Tannous has ranked as high as number 1 — in all of Asia — in her age group. Both the girls were about to leave in a few days for the “Cadet and Junior World Fencing Championships” in Uzbekistan. The sport has brought these students another tangible benefit besides their fencing success: All three are being wooed by top colleges. I asked how they got into fencing. Josef said he was into knights and swords as a kid, and when a friend told him about the academy, he stopped by and found his calling. Dominique was signed up by her mom, and found fencing fit her personality — she likes to be in every “play” of a sport. Morgan liked the way it combined fencing skills with the need to be in top shape, both physically and mentally. Coach Ripa said fencing is indeed more physical than people realize. A short three-minute match, he said, takes a lot of endurance — a full nine-minute match takes far more — and at big tournaments, you’re fencing hours a day for up to a week. Soon, it was time to duel. I had asked if I could face off against all three. They suited me up and plugged me in. My first opponent was Morgan. I was hoping that at 17, she’d be intimidated at facing an adult. Not exactly. Coach Ripa explained that many top fencing competitors are in their 30s and even 40s. Morgan’s weapon of choice is a foil, where you can only score by a touch to the torso. “That’s where all the good stuff is,” explained Ripa. “Heart, lungs and kidneys.” In the days of dueling, he said, internal damage is what did it — far more than slashing injuries. Ripa gave us the go. I took some steps forward, and almost politely, Morgan retreated. I thrust my foil at her and she parried without even trying to counter-attack. Clearly, she was showing me mercy. I got bold and went in again for a touch. She easily knocked my foil off-target, then put one into my vest. The scoreboard lit up. Point, Morgan. We went again — and this time her foil was a blur. That’s why fencing needs plugged-in “swords” and jackets. Coach Ripa explained that the whipping tip of the weapon is the second fastest thing in sports — after a bullet in sharp-shooting. Often, he said, you have less than a hundredth of a second to respond. Pretty soon, Morgan got a fifth point. I got zero. Duel over. Next, I faced Dominique in epee. That, too, only allows thrusting, not cutting, but in this case, you can score almost anywhere — not just the torso. We went back and forth with no blood drawn. She, too, was clearly being nice — so I decided not to be. I suddenly lunged forward and got an actual touch. The scoring system lit up. We got back in position. I lunged forward again, figuring this time Dominique would run for her life. Instead, she came right back at me and scored. She was clearly unhappy I’d made a touch and decided that was it for me. After that — I began to go into retreat mode, and found the 50-foot fencing strip is long. We kept up the dance another minute and by then, she had her five. Match, Dominique. And you know what? Fencing is tiring. After two matches, it was Academy girls 10, me 1. They had clearly both showed mercy. In sports, that’s worse than no mercy. It’s humiliating. So now, in my final match, against Josef in sabres, I told him — enough with the mercy. Give me all you got, kid. He clearly liked that idea. What he didn’t count on is I wasn’t going to give him mercy, either. Ripa asked if we were set. I think I’m still scarred by what happened next. The kid came at me so hard and fast there was no chance of fending him off — or frankly, even retreating out of danger. I was also too intimidated to attack since that meant lunging into a buzz-saw. Josef is a polite young man, but on the fencing strip, he doesn’t mess around. Within two seconds, point Josef. He nailed me good in the ribs. Most touches don’t hurt, but that one caught me just right. I didn’t show it, though. You can never show weakness in a sword fight. We got back into position. Josef came slashing at me again and quickly scored a second point. Then two more. There had probably been 15 seconds or so of actual fencing time and already I was slightly winded. Plus, Josef had four touches — one shy of victory. Now I’m going to admit something: After being nailed four times by a slashing, thrusting sabre, I was a bit scared. I don’t say that to sound dramatic. I mentioned it to Ripa and he said it’s true — serious fencing often triggers that response. The reptilian part of the brain, he said, registers the fear human ancestors felt when dueling was a real thing. Ripa told me that even to him, the thought of being in an actual sword fight would be terrifying. He did. He quickly got a fifth touch. Duel over. I stripped my gear off, having discovered fencing is a more physical sport than I knew. And more mental as well. With a more world-class operation than I expected here in Rhode Island. I realized it’s unlikely I’ll meet my goal from age 12 of being the world’s greatest swordsman. Some of the kids in this Academy here in Rhode Island — they just might do it. The Rhode Island Fencing Academy offers classes for ages 8 and up. Location: 14 Almeida Ave, East Providence. Phone: (401) 434-2404. Website: RIFAC.com.